The results are in! Based on your purchases this past year, we’ve revealed the most popular Sigma products that our customers can’t get enough of! Read on to find out what they are and why they made the top 10 list! F80 - Flat Kabuki brush: This infamous best-selling brush is known for its ability to seamlessly buff foundation onto skin for an airbrush-like effect. Thanks to the dense HD filament, you’re always left with a flawless foundation application. Mrs. Bunny Essential Kit: A vegan approach to classic tools! The Bunny Collection features 100% synthetic bristles among 12 brushes that come in a unique and functional container that conveniently turns into two brush holders. Not to mention the baby blue handles and pink ferrules make these brushes too cute to pass up! Limited Edition Paris Makeup Palette: Explore the City of Lights with this limited edition palette containing eight unique eye shadows, two blushes, one highlighter, and two best-selling brushes – all created by inspiration taken from the most famous monuments in Paris. Get it while you still can! E25 – Blending brush: Master the art of blending with this top-seller. The firm bristles on this brush allow for controlled blending. Use it to create a classic smokey eye or simply buff out harsh lines for a well-blended finish. Dry’n Shape: This one-of-a-kind tool was designed to extend the life of your brushes. Use it to completely dry and shape your most dense brushes in just 4-6 hours. Truly a must-have item for ensuring that makeup brushes get the best care possible! Performance Eyes Kit: A unique kit for advanced makeup artistry. Each of the eight brushes has a specific use to create the most detailed eye designs. Whether it’s adding depth to the crease or creating a perfect cat eye, the Performance Eyes Kit is your go-to kit! F40 - Large Angled Contour brush: Contour with perfection! The angle of the F40 makes for easy application of blush, bronzer and/or highlighter to enhance and define cheekbones. Mr. Bunny Travel Kit: Jet set in style with this beloved travel kit that contains seven brushes and a unique and functional container that conveniently turns into two brush holders. Brush Cup Holder: This innovative and functional container that turns into two brush holders to help you keep your brushes organized and neat whether you’re at home or on the go! 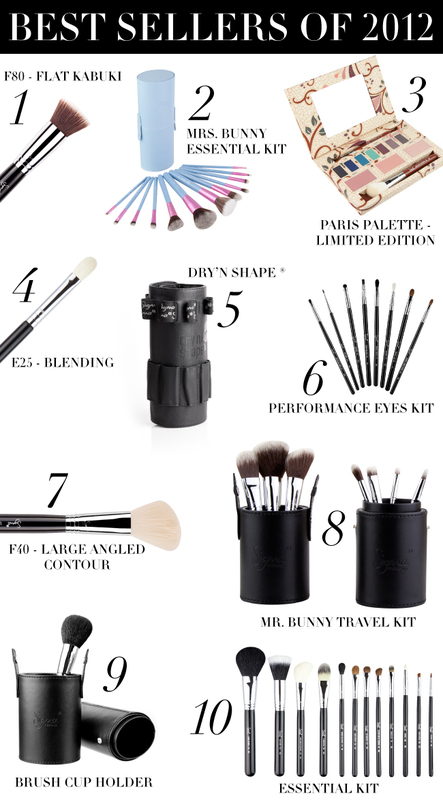 Essential Kit: Twelve brushes for basic makeup application -- all the essentials for a complete look! What is your favorite Sigma product? I have the angled eyebrow brushes! Love those - they give the most precise lines! Dream of consumption, the brand most desired by all women!